I had a garden-bed type project on my to-do list and needed to find something to use as borders. I would have liked to use plantation pine, but aside from rot, the white ants (termites) are very active and hungry critters out here and would have started chomping away at it before I’d fixed the final screw. Hardwood was an option, but the hardware store I visited couldn’t tell me much about the origin of their stock – whether it was plantation timber or the result of clearing – and the termites would have had their way with it in the end also. Rocks and concrete weren’t an option either. Then I started looking at various treated pine products. Every treatment appeared to have the potential to leach some form of chemical into the soil (stay tuned – article on this topic in the works). So I settled on plastic. Yes, plastic. This may sound at odds with what green living is all about, so I’ll quickly clarify before you scoot away in disgust. Recycled plastic composite timber. Composite plastic timber is the result of upcycling – or downcycling depending on how you look at it. These products give new life to plastic destined for landfill and wood waste, such as sawdust. The product I chose is made by Plastic Recyclers Australia. They sort waste plastic, which is processed into granulated form and then melted and mixed with wood fiber. This is then forced under pressure into moulds, which are cooled in large cold water tanks until the plastic is set. UV stabilized, these boards are resistant to water damage, termites and do not leach chemicals, so it’s safe to grow veggies in a raised garden bed using this as a border/retainer. Unlike working with wood, there’s no danger of splitting boards – I only have to look at a pine board and I swear it starts to split. This product can be easily sawn, drilled, nailed and screwed. 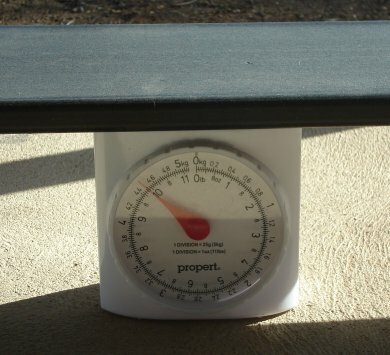 The first thing I noticed (as did the courier) is the weight. The boards are very solid, tipping the scales at 4.5kg (~10lbs) per meter (~3.3 feet) length of 20mm x 200mm (~3/4″ x ~7 3/4″) board. 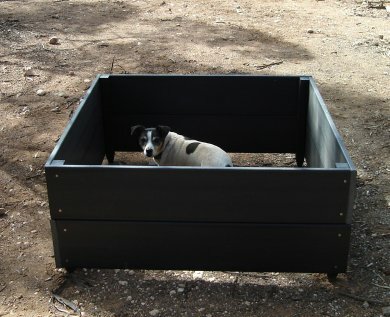 Composite plastic lumber certainly isn’t as cheap as pine or even many types of hardwood, but the company offers a 15 year guarantee and I can see why – this raised garden bed may outlast me. You can buy these particular boards in various sizes or in garden bed kits in any color you want, as long as it’s black :). Being black, I was a bit concerned about the boards getting very hot, so I left one out in the sun for a few hours on a hot day. While the side facing the sun certainly heated up, the other side stay relatively cool by comparison. There was also no apparent warping – according to the company they will retain their shape over their long life. The boards can be painted using a special primer, but then you may face leaching issues from the paint or primer (something I didn’t look into as I’m not painting them). I have seen other recycled plastic boards around featuring wood-grain type patterns and various colors, but most of those were hollow and I wasn’t confident they would stand up to the harsh conditions this garden bed will contend with. While Plastic Recyclers Australia’s products aren’t available outside Australia, New Zealand and some parts of South East Asia as far as I know, a search on Google for composite plastic timber (or lumber) may turn up a similar product in your country.